Autoimmune diseases are on the increase at an alarming rate. 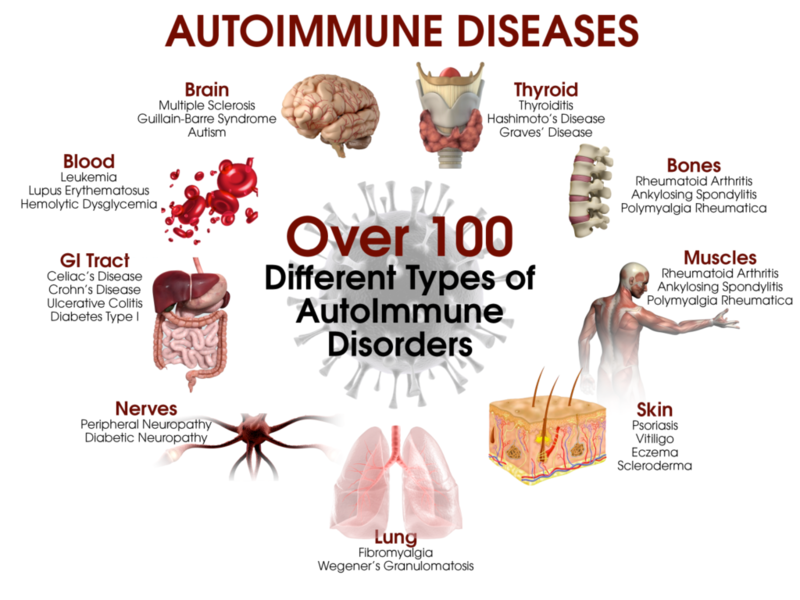 There are over one hundred known autoimmune diseases and symptoms can affect all body organs, including Crohn’s, MS, ulcerative colitis, endometriosis, thyroiditis, rheumatoid arthritis, asthma, and more. Even cardiovascular disease is now under consideration of an autoimmune disease. At present there are 50million living with an autoimmune disease in the US, and the number keeps rising. Depending whom you ask, whether a conventionally trained physician or a holistic practitioner, you will also get differing answers to this big question of why the body starts fighting itself. The word ‘idiopathic’ is often mentioned in conventional medicine, yet there is a reason why the body is over-reactive: Processed foods, inhaled toxins, commercial personal care products, medications, smoking, and subclinical infections of any kind contribute to an autoimmune process that is coupled with inflammation and a burden on the liver and kidneys. Lyme disease can mimic every autoimmune disease. An errant immune response is harmful, even life threatening, as tissues of organs and glands are attacked with severe inflammation. All immuno-supressing drugs come with severe side effect. But does one really want to suppress the immune system, our internal defense system against infections of all kinds, with long-term use of meds? Genetic predispositions come into play, however it is important that genes only indicate our potential to overcome infections and toxins. They are not our destiny. We can change our genes: Food and lifestyle, infections, and toxic exposures the environment have more impact in how non-health supporting genes are ‘switched on’. This is the basis of epigenetics. Let us consider this in a simplified form, as frankly nothing in the body is simple! To the contrary, our body is brilliant and everything that occurs in the body happens for a reason. Our body has an innate sense of survival. It eliminates any perceived threat. Period. Once the immune system goes into overdrive and attacks tissue e.g. the thyroid as in the common Hashimoto Thyroiditis, it enables the potential that over time other organ or glands will be affected unless this cycle is interrupted. But why is this happening? The immune system cannot distinguish self from non-self. Why does the body start is attacking itself? That is a million-dollar question and there are so many reasons why this can occur. A ‘leaky gut’ also called intestinal permeability plays an important role. This can be the gateway, an entry point for an autoimmune process. With a leaky gut, protein molecules from foods, infections plus toxins have easy access into the blood supply – where they are not supposed to be. The immune system goes into high alert as it senses a threat. Some foods or infections have the protein structure of our own cells. In trying to get rid of the foreign protein, a hyper-vigilant can mistakenly attack our own cells while trying to neutralize the foreign particle. This is a process called molecular mimicry where a hyper-vigilant immune system damages our own glands, nerves and organs. Function becomes compromised. Excess zonulin and histamine are common co-factors. Both contribute to inflammation of the gut lining and food sensitivities. An infection can be another trigger of autoimmune disease. Lyme can cause MS, Lupus, Parkinson’s, Alzheimer’s disease and more. Klebsiella is connected with ankylosing spondylitis, intestinal bacteria and a co-infection with Lyme called Bartonella is also connected with rheumatic arthritis, etc. Yet no test is foolproof as microbes hide in tissues (not the blood), or self-destruct once they leave our body. They are smart, as they want to evade detection. Doing a parasite cleanse every year is another helpful consideration. And make sure the bowels are moving. Yes, I always talk about poop! How do we measure health in our dog or in a baby? It is no different in adulthood… even though when was the last time your doctor asked you about bowel movements? Accumulative exposure to many chemical pollutants and pesticides can ‘turn on’ genetic predispositions. In addition the environmental toxic burden we live with today is already a great inflammatory backdrop for all other health challenges. Pesticides on foods, esp. glyphosate from Monsanto irritate the immune system and mess with our estrogens. Phtalates are toxic and estrogen-like plastics that wreak havoc on the immune system. Aluminum that we breathe in in the air… and that is part of a vaccine or Flu shot, can over-stimulate the immune system. Today we need two livers and four kidneys to deal with the toxic onslaught (!) and government policies certainly do not help. Detoxification, and not just a Cleanse–once-a –year is called for. This might include using milk thistle, or drainage remedies, e.g. nettle tea, red rot, or eating cruciferous vegetable, and garlic, or the sauna, while optimizing elimination. Also consider adequate hydration with filtered water to flush out toxins from the kidneys. Sweating is a great way to get rid of toxins, especially arsenic. So make sure to wipe of your sweat! Conventional doctors are trained in giving the ailment a label, so a drug can be applied. It is not concerned with finding out the ‘why’ factor. Instead it is concerned with putting a bandaid on symptoms so you can lead your life. Living a life on immunosuppressing drugs opens up the door for ongoing side effects, serious infections, pancreatitis and cancers. It is rabbit hole in the long run. Yet in fairness, we too have to take responsibility should we be dealing with an errant immune system. It often requires a change of daily habits in regards to dietary choices and lifestyle modifications. Would you not want to at least look at different reasons of why the immune system has gone haywire and is attacking innocent bystanders, aka, your cells? To restore regulation in the body is a process that takes time and patience, with nutritional, lifestyle, nutrient and botanical interventions, your body has a chance to heal.